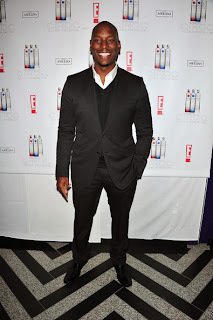 JR, The Black Entertainment Guide: Tyrese makes official Big Screen return with "Fast Five"
Tyrese makes official Big Screen return with "Fast Five"
Currently, Tyrese Gibson is one of the biggest entertainers on the planet, but his career has humble beginnings. Tyrese began his career singing short jingles for various commercials. Once his buzz built, he was soon doing cameo spots in several videos. His most-notable appearance was in Usher's "My Way" video. Following his appearance in Usher's video, Tyrese was soon being groomed as a possible competitor to Usher. Tyrese had his own career and he was gaining popularity. Soon, Tyrese was a platinum singer in his own right. His biggest single, to-date, was his 2003 top ten smash, "How You Gonna Act Like That." Tyrese has since taken a back seat with music, focusing on his budding film career. The Fast and the Furious became a film franchise in 2001. Initially, Ja Rule was invited to become the face of the franchise. At the time, Rule was the biggest rapper in the game. Due to his popularity, Ja Rule demanded more money than the company was willing to spend, so he was replaced with Tyrese. Tyrese has reprised his popular role in the film series for the latest, Fast Five. The new film premiered earlier today.